The THCAD is a frequency to voltage converter type A-D designed for high noise environments like plasma voltage monitoring for torch height controls. The THCAD is available in two voltage ranges, 0-10V and 0-300V. When used for plasma voltage monitoring, the 10V version requires an external high voltage resistor. The advantage of the 10V THCAD and external resistor is that the resistor can be selected to work with high-frequency start torches. The 300V version of the THCAD has all input divider resistor on board and can connect directly to the plasma voltage of touch start type torches only. The THCAD has a frequency output range of approximately 100 KHz to 1 MHz. T his can be counted directly by our FPGA cards for conversion to voltage value. The frequency output can optionally be divided by 32, 64 or 128 if the output must be counted in software. Frequency and reference frequency outputs are available. Both outputs are differential for high noise immunity. The A-D has galvanically isolated inputs (2500V common mode isolation). 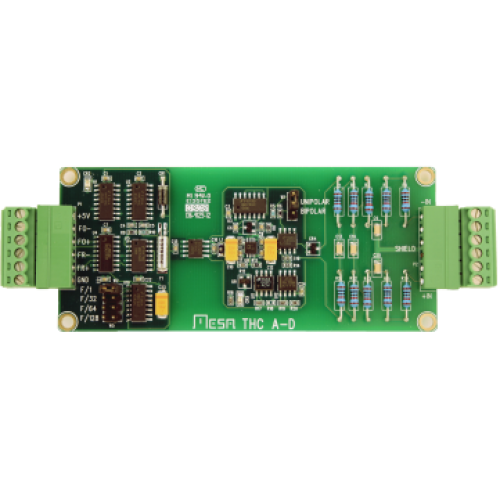 The 10V model can withstand a 500V input overload indefinately. The 300V model can withstand a 2500V input overload indefinately. Being a frequency to voltage type A-D, resolution is sample rate dependent and approximately 10 bits at a 1 KHz sample rate and 12 bits at a 250 Hz sample rate. The THCAD is normally used in unipolar mode but can be jumpered for bipolar mode for non-plasma applications. The THCAD requires 5V at 150 mA for operation. Pluggable screw terminal blocks are provided for all connections.